What's with That Obama Poster? Underground artist Shepard Fairey has created a poster of Barack Obama that has been popping up all over the U.S. Fairey says he never expected to see it used the way it has been. What's with That Obama Poster? There's a red, white and blue image of Sen. Barack Obama that you've likely seen by now — it has appeared on the front page of The New York Times, on bumper stickers and across billboard ads. 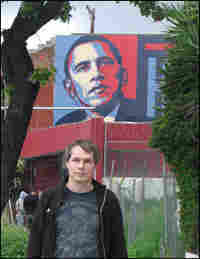 Los Angeles-based street artist Shepard Fairey is the man behind the design. Fairey first made a name for himself in the late '80s with black and white stickers featuring wrestling legend Andre the Giant. Fairey is known for putting his stickers and posters in unlikely and often illegal places. "That's always been my style," Fairey says. "I don't get permission. I just do it." He has the arrest record to prove it. And that's why, at first, he wasn't sure how the Obama campaign would feel about an artistic endorsement from him. But just before Super Tuesday, Fairey says, he got a call from the campaign telling him to go ahead and make a poster and distribute it in his typical guerrilla fashion. Soon after, the image began popping up in home windows and under people's e-mail signatures. "The part that I didn't expect was once it was posted online what it would achieve virally," Fairey says. Neither did Fairey expect to make money off the political move. When he put several hundred posters he'd signed up for sale at his Web site for $45 a pop, they all sold out within minutes.